Crayon Freeze Package - $9.99 SAVINGS! 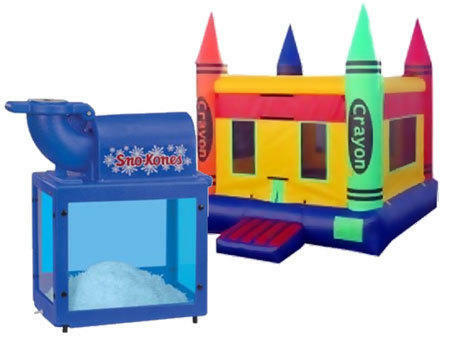 In the Crayon Freeze Package you'll get the awesome crayon bounce house that's ready for colorful fun, and the U Bounce Sno-Kone Machine. Includes supplies for 50-60 servings. Click "add to cart" to choose your 2 favorite flavors. Additional supplies available upon request for an additional fee. Ice is not included. The suggested amount for 25-30 servings per 8-lbs of ice cubes. *Keep in mind that ice melts and your yields will vary according to temperature.